Great day today, since the biggest international football competition has just begun. National teams competing for one whole month. Every match is important and today the premier Brazil vs Croatia. Brazil having its best defensive line ever accepts a goal in the first quarter and an own goal by Marcello that is. I just know they will win the competition since 2008. I even placed a bet when I was in London at the time but good luck finding the slip:). Any how my prediction for today is the draw. I was expecting 16 year old looking Modric to score first and Neymar to make the comeback in the second half. No the game changed completely sonce the pressure is even higher on the competition host since an own goal is not the best confidence Booster. 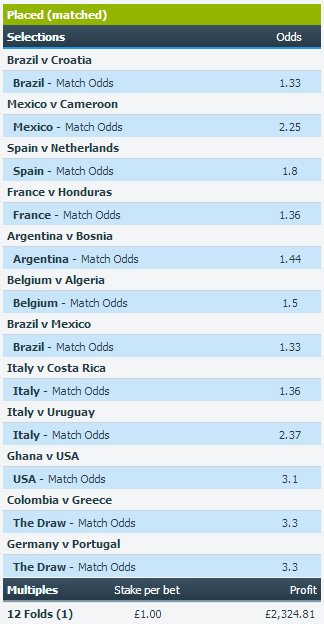 Here are is my suggested bet. Happy football watching my friends!